E. Phillips Oppenheim, an English novelist created well in excess of 100 novels and 30 plus collections of short stories. Most of his tales are thrillers and espionage. 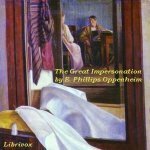 The Great Impersonation was written following World War I and is considered by many to be perhaps his best novel. The story focuses on German espionage in England prior to the start of World War I. The tale centers on two characters that are almost identical in appearance. Indeed, while both attend the same school in England, they are often mistaken for one another. One character is Sir Everard Dominey, an English baronet who enjoys the “good life” but falls into disfavor when he is accused of murdering Roger Unthank. Unthank, of the same village, has an infatuation for Dominey’s wife, Rosamund, and attacks Dominey. Dominey comes before his wife bloody and ragged after the struggle with Unthank. The spectacle renders her unbalanced. This is more than Dominey can bear and he goes on a long travel and drinking binge spanning years. Dominey’s wife threatens to kill him if he ever returns. The second character is Baron Leopold von Ragastein, a German nobleman. Von Ragastein has fallen into disrespect with the Kaiser for his affair with a Hungarian princess and subsequent killing of her nobleman husband in a duel. He is banished to a minor government position in East Africa as punishment. A chance encounter between Dominey and von Ragastein in German East Africa sets the pretext for the story. Von Ragastein returns to England as Dominey, to regain his position in society, and serve Germany by influencing England to keep out of the coming conflict. There is one problem however: there are some, including Dominey’s wife, who are not convinced that Sir Everard Dominey is really who he claims to be. You will need to listen to the end to determine the truth.